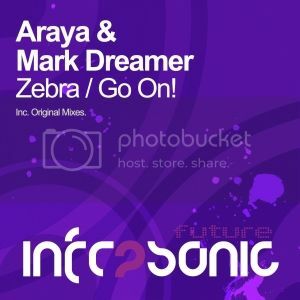 Araya & Mark Dreamer - Zebra E.P [Infrasonic Future] | OUT NOW! Thread: Araya & Mark Dreamer - Zebra E.P [Infrasonic Future] | OUT NOW! Araya & Mark Dreamer make their storming return to the Infrasonic Future imprint with the behemoth ‘Zebra E.P’, which features a duo of full energy, lush trance masterpieces. We begin with ‘Zebra’, with its dirty bass groove and infectious energy. Watch out for that divine drop and epic break with its plucky, playful piano keys and feel good chords. On the flip there is ‘Go On!’ which continues with that dirty bass sound that these guys have honed and once again, delivers bags of energy. The breakdown is where the magic happens with its huge emotive strings and euphoric energy, just in time before they drop that epic lead – massive!